The last time I’d read about the university of St Andrews, it was about the boom in student applications (and admissions) from the US and other countries abroad. Now, the Herald-Tribune has a story about Louise Richardson, the new university president — St Andrews’ first female president as well as its first Catholic and first Irish president. She’s been brought in particularly to help appeal to international students and to bring U.S.-style fundraising. The IHT story is a little weird — it nonsensically leads with a discussion of golf. Somewhat cooler are the details about Richardson’s installation – oaths and prayers in Latin, ceremonial maces, crazy regalia. If there’s a real “controversy” here, it won’t be about Richardson’s membership (or non) in golf clubs, but how she may shake up a place as thoroughgoingly traditional as St Andrews. Worth watching. The golf lede is not *entirely* nonsensical; St Andrews is where golf was invented, and the Old Course is, uh, the first one. BUT, agree, the substance of the story is a lot more interesting. 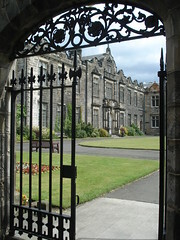 I visited St Andrews back in 1998 and really enjoyed the town & the university alike. Oh, I totally knew that; I’ve been watching British Opens at St Andrews since I was a kid. Or they needed a “controversy” about the first woman president, and the golf course was the only thing remotely close.